I have tried several different car chargers for my cell phone but I want to tell all of you about Meagoes Dual USB Car Charger. This charger has intelligent circuit design that protects against short circuiting, over-heating, over-charging, and over-current. This dual USB charger automatically stops when the battery is full, to protect your devices. This charger has 2 smart USB ports that automatically identify your cell phone model to provide stable current output, you can charge 2 phones or devices as you drive. This charger is compatible with Smart phones, tablets,MP3 players, digital cameras,Kindle, power banks, GPS, dashboard cameras, bluetooth speakers, or most any other digital devices. 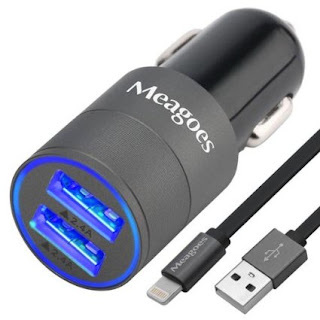 This car charger has 4.8 amp output, shared by 2 smart USB ports, giving 2.4 amps per outlet allowing fast charging . It also has high-frequency and low ripple filtering capacitor so that this charger doesn't interfere with radio reception, bluetooth, or WiFi signals.